Charming 2 bedroom villa, across from the ocean, and a few minutes walk to the Tryall Beach Club. This wonderful villa with own private swimming pool can sleep up to 6 persons. 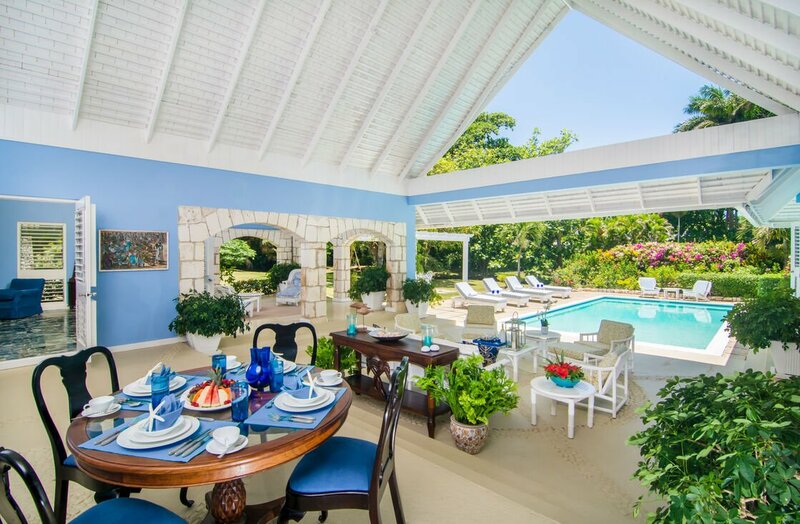 Little Palm Villa in Montego Bay is one of the very captivating private Jamaica villas, across the street from the glittering Caribbean Sea, with the 17th fairway of the renowned Tryall golf course at its rear. The villa has lovely architecture with the swimming pool as the central feature. Being part of a gated community, the villa has a 24 hour security system. The airport is only at a 20 minutes drive from Little Palm Villa. Tryall's only two bedroom estate villa, Little Palm lives large nestled on a 3 acre property, on the 17th hole and a short walk or quick golf car ride to the beach. Two large bedroom suites, grand entry hall, private pool, indoor/outdoor lounges, and experienced staff, including private chef, are some of the features that ensure guests enjoy a luxurious and memorable holiday. A favourite of honeymooners, this spacious yet intimate hideaway is also the choice for couples, small families or close friends who want privacy rather than a large group holiday. A housekeeper, groundsman, and chef ensure guests are pampered and treated royally. The villa designed by Jamaica's master builder, Giuseppe Maffesanti, in 1959 as a summer cottage for an English Count, Little Palm is truly a jewel in Tryall's crown. 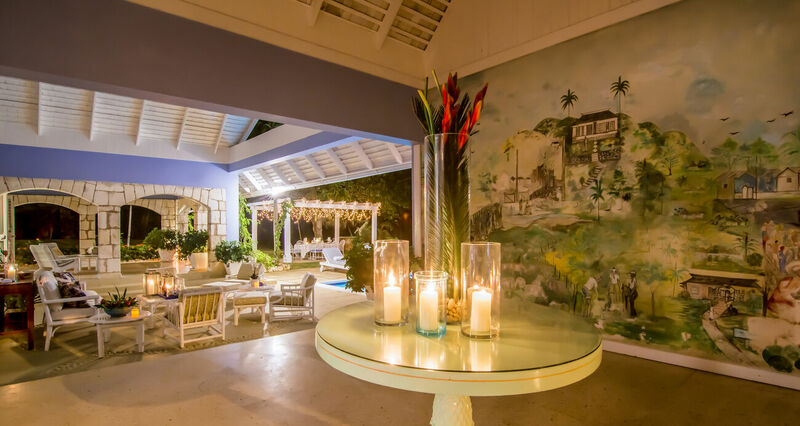 The villa is completely updated with all modern amenities, including solar energy, and is decorated in timeless Caribbean-inspired décor with furnishings custom made by local artisans especially for the home. Rooms are equipped with flat screen TVs, Cable, ceiling fans and air conditioning. The historic floor-to-ceiling hand painted mural in the entry, hand hewn limestone wall and arches, and Royal Palms on the expansive immaculate property, give the villa and grounds its charm, refinement, and historic sensibility. The large master bedroom suite boasts a generous en suite bathroom and its own patio for private relaxation. The guest room with en suite bathroom overlooking the pool has twin beds (convertible to a King) and an inviting window seat/daybed perfect for an afternoon nap. Breakfast in the dining area is a wonderful start to your day. In the afternoon, indulge yourself with high tea in the garden. 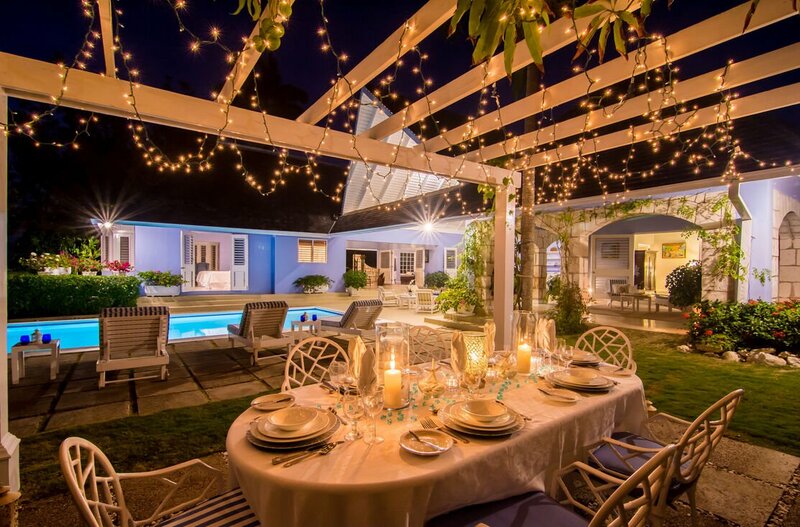 Enjoy an intimate dinner for two or a BBQ of lobster or anything your taste buds desire under the canopy of the starlit sky and a romantic pergola. A window seat, large 55” Sony flat screen TV, card table and chairs, Sunbrella upholstered furnishings in the living room invite guests to gather after a day of sun and fun. The large lounge looking out to the pool is the choice spot for cocktails and a lively evening soiree. EXTRA PERSON CHARGE IS $150 PER WEEK PER PERSON.